Notes: Checklist probably incomplete. Unnumbered. Blank-backed. Collector Terry Gomes is of the opinion that this set was issued in Canada. 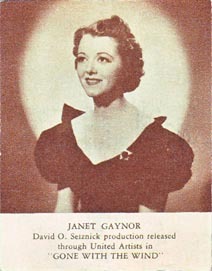 Date info: The card of Janet Gaynor has her listed in appearing in the classic film "Gone With the Wind." In fact, she did not appear in that film, which was released in 1939. In 1938, it was said that she was considered for a part in the film. It is likely this card set was issued in 1938, as Gaynor would not have been associated with "Gone With the Wind" in 1939. The Henry Fonda film mentioned on his card was released in 1938, reinforcing the 1938 date for this set. Thanks to Terry Gomes for proving the information for this checklist.